Low Self-Esteem. Abused. Degraded. Misunderstood. These words are frequently used to identify teenage girls when discussing the various trials and tribulations they face on a daily basis. Overwhelmed by life experiences, these girls often find it difficult to open up and share their problems. They may feel as if their circumstances are so overwhelming and their pain is so deep that talking about them will not make a difference. 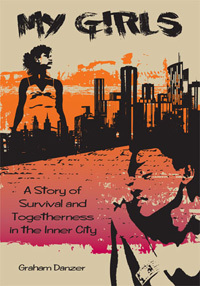 My Girls: A Story of Survival and Togetherness in the Inner City explores the real, emotional, and raw experience of working with at-risk African American teenage girls. The book is based on Graham Danzer's clinical study of counseling six teenage girls in a group setting at an inner-city public school. It explains what the author learned from the girls' struggles and how he was able to penetrate through cultural, gender, and racial barriers. It tells a tale of reciprocal enrichment and enlightenment. • provides information for clinicians in the field of cross-cultural clinical practice and awareness.